Grandma Bonnie's Closet: $1000 value Free Blogger Opportunity Giveaway Sign Up. $1000 value Free Blogger Opportunity Giveaway Sign Up. 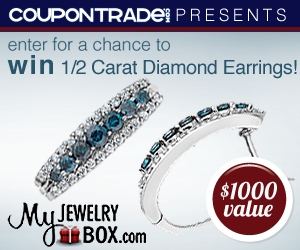 How would you like to giveaway a stunning pair of 1/2 carat (ctw) diamond earrings, valued at $1000. Your Twitter link is free if you create a post about sign ups. Stop over to fill out the sign up form here. Those earrings are so gorgeous! Someone is going to be lucky. I don't have pierced ears but those earring are beautiful.